Andreras Kriegenburg (AK) scored twice in this year’s Munich Festival – his Ring and the revival of his 2008 production of Wozzeck. 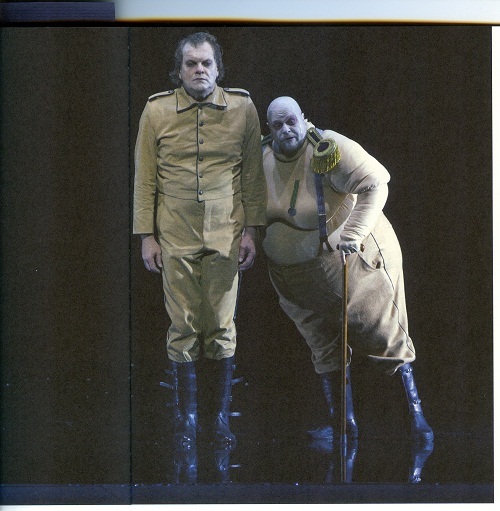 Alban Berg based his Wozzeck on Georg Büchner’s 1836 play Woyzeck which AK had staged in the Berlin’s Volksbühne theater in 1991, and which could be considered as his preparation for this opera. AK comes to opera from theater – he worked with the Volkbühne and became its permanent director – but he feels comfortable in both and this can be seen in this production. He brings in the stress on the dramatic and on body language, so much more effective and poignant when paired, as it is here, with a singular economy of means he demonstrates in both Wozzeck and the Ring. Two elements are characteristic to both productions: the aforementioned economy of means which translates into an extremely simple and elementary set – here a bare-walled box open to the audience, lifting up and down and back and forth, and the use crowds of men and women as a mute, living prop, whether a crowd of Unemployed, of Homeless, of Hungry (fighting over scraps of food, tossed periodically among their midst), of Soldiers, of Children. All these are symbols of what they represent, never recognized as individuals but used as anonymous mass. And they all inhabit, in turn, the foreground of the stage and the foreground of the box – a layer of water, just another Nature’s punishments to make life a transit through hell. They all suffer this test; at final bows even the conductor has to come on stage in rubber boots. Although Büchner placed the action in 1820’s, AK chose, rather, a century later, the “golden years” of Weimar republic. It is a caricature of the twenties, as seen through the eyes of Georg Grosz; a caricature of a caricature. It touches obliquely rather than directly upon human condition; a consideration at arm’s length. The Doctor/Clive Bailey, and the Hauptmann/Wolfgang Schmidt, make gruesome violence and abuse appear ceremonial and matter of fact, Hannah Arendt’s “banalityof evil”, that we, almost a hundred years later still witness and ignore daily. In their images, Andrea Schraad’s costumes reach grotesque apotheosis. The costumes classify the individuals. With the exception of Wozzeck, Marie and the child, the triple fulcrum of the work, all other characters sport unnerving white faces. The cast is evenly excellent. With Berg’s music, it is not lyricism or vocal pyrotechnics that counts but the musical expression of crude life’s penalties. Wozzeck/Simon Keenlyside and Marie/Waltraud Meier, are utterly convincing in their roles mainly by their directness and simplicity against the background of the murkiness of other characters. The Doctor’s and Hauptmann’s roles require more histrionics than singing and they both deliver. The Drum Major/Roman Sadnik, prances satisfactorily. As a typical AK touch, he is brought upon stage on a platform, carried by bearers on their bent backs, straight out of an Assyrian frieze. Human abuse and humiliation have no bounds here. The heartbreaking lyrical passages showed Lothar Koenig’s conducting at its best. As an unmistakable sign of appreciation, this production garnered more intense and prolonged ovation than any of the Ring’s parts.